The public clock served the functional purpose of telling passers-by the time. But it also served as a village landmark, a reference point, and a symbol of civic pride. Indeed, public clocks were something of a status symbol for a community, a sign that a town had reached a certain level of prosperity, that there was action there. A clock was ordered from France soon after the dedication of the Our Lady of Peace Catholic Cathedral. Bishop Maigret sent the order through the office of the superior of the Sacred Hearts Fathers and Brothers in Valparaiso, Chile. It was sent there for inspection before it was forwarded to Hawai‘i. For some unknown reason, it was switched with an older clock in Chile. (Cathedral of Our Lady of Peace) This ‘second-hand’ clock was installed in the Church’s original tower in about 1846. (Historic Hawaii Foundation) It is the oldest tower clock in Hawai‘i. Kawaiahaʻo Church, designed by Hiram Bingham and constructed between 1836 and 1842, was in the New England style of the Protestant missionaries. Its tower clock is commonly referred to as the Kauikeaouli clock (four faces,) in memory of King Kamehameha III, its donor. It was made by the Howard & Davis Clock Makers of Boston, Massachusetts. Mechanics arrived with the clock in 1850 and preparations were made for its installation – King Kamehameha III was selected to supervise the task. The clock, which tolls the hours, still operates on its original machinery. Another Harbor timepiece (and still keeping time) are the four clocks on Aloha Tower (construction began in 1924.) It was completed in a year and a half and became the landmark of Honolulu. At 10 stories and 184 feet of height topped with 40 feet of flag mast, for four decades the Aloha Tower was the tallest structure in Hawaii. It was built in the Hawaiian Gothic architectural style. The 4 clocks, each face 12 feet in diameter (by far the biggest clock in the Territory of Hawai‘i and one of the largest in the United States at the time) and facing different directions, were made of bronze and weighed 7 tons each. If a ship or person was too far away to read the clock, two other means of time synchronization were provided. A time ball was lowered to the bottom of the forty-foot mast atop the tower each day at noon, and the blast of a siren was sounded at 7 am, noon and 4 pm. Aloha Tower was built as a control tower for the Honolulu harbormaster and a lighthouse as part of a modern freight and passenger terminal at piers 8, 9 and 10. In addition, it provided offices for the harbor master, pilots and customs officials. The eleventh floor of the tower served as a lookout for the harbor pilots, with balconies on all four sides. The Kaʻahumanu Church began on August 19, 1832; the first services were held under a thatched roof. The present Kaʻahumanu Church is actually the fourth place of worship for the Wailuku congregation. The original congregation, under the leadership of the Reverend Jonathan S Green, was forced to hold their meetings in a shed. Active fundraising under Pastor William Pulepule Kahale led to the opportunity to finally build a permanent church. Under the direction of Reverend Edward Bailey, in May, 1876, the new church, finally named the Kaʻahumanu Church, was completed. The Kaʻahumanu Church is a large blue stone structure with wall more than two feet thick. It has a high-pitched gable roof with no overhang, but the eave terminates in a small molding adjacent to the top place along the wall. The exterior is finished in plaster. The church tower was not added until 1884 with a “fine tower clock from the U.S. costing $1,000.” In 1892 the chandeliers were added to the interior. Hilo’s Waiākea Social Settlement Clock was dedicated in 1939, in memory of Mrs CS Richards. The May 23, 1960 tsunami damaged the clock – it stopped at 1:05 am, when the tsunami struck. It was restored on its original pedestal and reminds all who pass of the timing of the tsunami. The Greens were assigned to Lāhainā on the island of Maui until 1831, then Hilo for one year. In 1833, they moved to Wailuku, back on Maui, and built one of the first permanent houses there. The house is now known as the Bailey House, a two-story lava stone structure with 20” thick walls and a high-pitched roof covered with wood shingles. During its first year, Queen Kaʻahumanu, the Kuhina Nui of the Kingdom and convert to Christianity, visited the congregation and asked that when the congregation built an actual church, it be named for her. The congregation’s small shed meeting house soon proved too small as the service held there attracted as many as 3,000 worshippers. In 1834, a larger meeting house with a thatched roof was erected by the congregation. First known as Makawao Foreign Church and Congregation, Makawao Union Church received a charter from the Hawaiian government in 1861, although Green had been holding services in his Makawao home from 1857. He continued to serve as the pastor of Poʻokela Church, as well as the Makawao Union Church which was started to meet the needs of the English speaking, foreign community around Makawao. Green’s first wife died October 5, 1859 and on September 5, 1861 he married Asaneth Spring. In 1878, at the age of 82, Jonathan Green died. Asenath Green, and daughters Laura and Mary, continued to advise the church. Mrs Green applied to the Hawaiian Evangelical Associate (HEA) for assistance and ministers were obtained for a time. From 1885 to 1889, the reverend John Kalama pastored the church. The following years saw a transition from Hawaiian to English-speaking services. In 1904, Poʻokela Independent Church gave up its independence and merged with the HEA. Shortly thereafter, the church fell into disrepair. During WWII, church buildings were converted to classrooms for the primary grades of Makawao School (the US Army took over the school for a military hospital.) “Aunty” Kalama provided the vision and energy to keep things moving. Following the war, a reopening of the church took place. With the changing demographics of the region, the church evolved into a multi-ethnic church. The image shows Poʻokela Church. In addition, I have added other images in a folder of like name in the Photos section on my Facebook and Google+ pages. The church began on August 19, 1832; the first services were held under a thatched roof. The present Kaʻahumanu Church is actually the fourth place of worship for the Wailuku congregation. The original congregation, under the leadership of the Reverend Jonathan S Green, was forced to hold their meetings in a shed. During its first year, Queen Kaʻahumanu, the Kuhina Nui of the Kingdom and convert to Christianity, visited the congregation and asked that when the congregation built an actual church, it be named for her. Queen Kaʻahumanu was Kamehameha’s favorite wife. She was, at one time, arguably, the most powerful figure in the Hawaiian Islands, helping usher in a new era for the Hawaiian kingdom. When Kamehameha died on May 8, 1819, the crown was passed to his son, Liholiho, who would rule as Kamehameha II. Kaʻahumanu created the office of Kuhina Nui (similar to premier, prime minister or regent) and would rule as an equal with Liholiho. She ruled first with Kamehameha II until his departure for England in 1823 (where he died in 1824) and then as regent for Kauikeaouli (Kamehameha III). Ka‘ahumanu assumed control of the business of government, including authority over land matters, the single most important issue for the Hawaiian nation for many generations to come. She later married Kauaʻi’s chief, Kaumualiʻi, who Kamehameha I had made a treaty with instead of fighting and thereby put all the islands under single control. On December 4, 1825, Queen Kaʻahumanu was baptized and received her new name, Elizabeth, then labored earnestly to lead her people to Christ. The congregation’s small shed meeting house soon proved too small as the service held there attracted as many as 3,000 worshippers. In 1834, a larger meeting house with a thatched roof was erected by the congregation. The Reverend Richard Armstrong who had replaced the Reverend Green as pastor in 1836, supervised the construction of two stone meeting houses one at Haiku, and the other at Wailuku. The new Wailuku Church, completed in 1840, was 100 feet by 52 feet, and was two stories (actually one story and a gallery) in height. Reverend Green returned to replace Armstrong in 1840. In 1843, the Reverend Green was replaced by the Reverend EW Clark. Five years later, Clark was transferred to Kawaiahaʻo Church in Honolulu, and the Reverend Daniel Conde took over the pastorate at Wailuku. Later, Reverend WP Alexander became pastor. Only a rock retaining wall that borders High Street in Wailuku is what remains of the old church. The structure is four bays in depth with each bay having a single tall Gothic arched window with the interior of the window opening splayed. Windows are multi-paned, double-hung wood frame with simple pattern in the upper part of the arch. 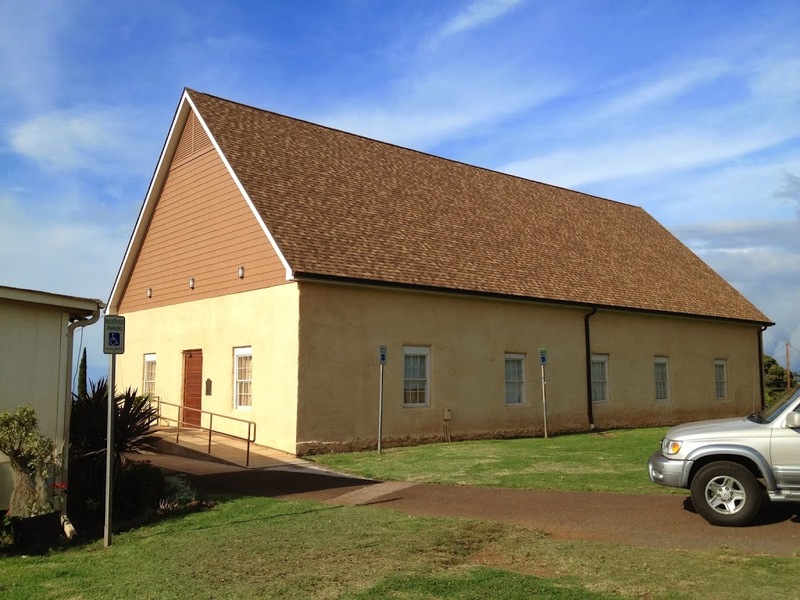 Although not a part of the neighboring historic district the Kaʻahumanu Church adjoins several other historic structures that make up the Wailuku Historic District. Click HERE for some more information on those properties. 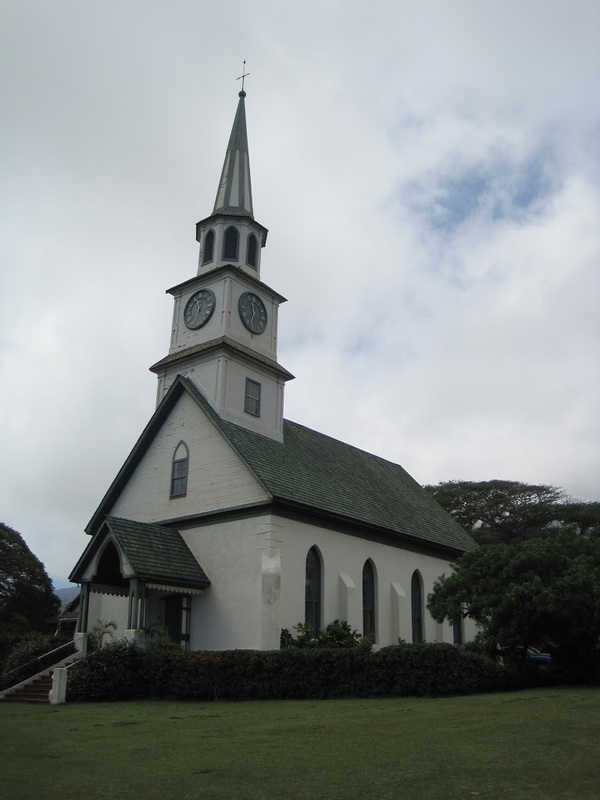 The image shows the present Kaʻahumanu Church in Wailuku. I have added other images to a folder of like name in the Photos section on my Facebook and Google+ pages.